The aspara™ smart indoor grow box is a miniaturized hydroponics farm system. The hydroponic growing method cuts out the need for harmful chemicals and pesticides and uses only 10 percent of the water that would be used in typical farming methods. 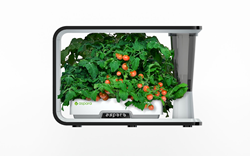 “The aspara™ smart indoor grow box is a miniaturized hydroponics farm system. Hydroponics is a method of growing plants without soil by using mineral nutrient solutions in a water solvent. The hydroponic growing method cuts out the need for harmful chemicals and pesticides and uses only 10 percent of the water that would be used in typical farming methods,” said aspara™ Creator Dr. Humphrey Leung. aspara™’s smart built-in sensors monitor, detect, report and record growth conditions based on nutrient concentration, air temperature, humidity, water temperature and overall water content in the system. The sensors will adjust lighting, water flow and planting modes based on a plant’s needs. Precise monitoring of the growth conditions provides accurate instruction on the amount of water and nutrients required to be refilled into the system. The adjustable grow light provides a full spectrum of intensity that caters to the needs of different plants at different growth stage. Users can control growth through specific programs, replicate nature with sunrise and sunset scenery and adjust the lighting to “dim” or “photo” modes. The aspara™ app provides necessary information, such as plant’s light, water, temperature and nutrient information. The app also tracks a plant’s activities and conditions and includes a community platform for users to share their plants’ growth with others who share a similar passion.